This is not a book written in any way about education, but it is just as relevant to anyone building a management team in any school, and is in my opinion a MUST read. 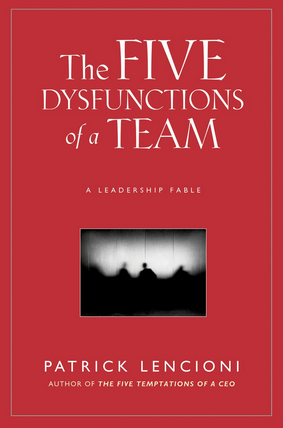 Lencioni tells a story of leadership based on a fictional corporate executive team, identifying five “dysfunctions” within the team – absence of trust, fear of conflict, lack of commitment, avoidance of accountability, and inattention to results. The book contains a detailed model for diagnosing the five dysfunctions and shares exercises and techniques to use to address them within your own teams. The advice is straightforward, simply explained and really easy to follow, and the book contains a questionnaire which you can use to evaluate your own team. (There is also a great YouTube presentation which I have used a lot in school, where Lencioni delivers the full story HERE). No: Lencioni is telling a fictional story, based on his many real experiences, but the book does not provide any corresponding literature or links to research from other work to reinforce the points he makes. The ‘real-world’ practicality is the strongest aspect of this book I think.